*Pre-requisite: Completion of Esthetics program and/or Esthetician License at a licensed esthetician school. 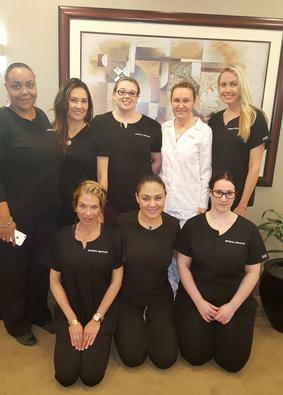 The Master Esthetics program is developed to provide Esthetician with the underpinning knowledge and skills to perform advanced dermal therapies. The program is designed to train the students in the esthetics courses advanced manipulative skills, safety judgments, proper work habits, business skills, and desirable attitudes necessary to obtain licensure and for competency in job entry-level positions in advanced Esthetics or a related career field. Project professionalism, visual poise and proper grooming. Communicate effectively and interact appropriately with colleagues, supervisors and clients. Perform advanced manipulative skills in the areas of advanced skin care and dermal therapy. Perform detailed and precise analytical skills to advise clients on their skin and its health. To ensure continued career success, the master esthetician school graduate will continue to learn new and current information related to skills, trends, and methods for career development in master Esthetics and related fields. All courses and schedules are available on a minimum class start. Classes may be cancelled, postponed or rescheduled due to class, faculty or instructor scheduling conflict, as well as in the case of insufficient enrollment. The Esthetic Institute reserves the right to make said changes without prior notice. The School offers makeup hours for students enrolled in licensure classes who would like to make up missed hours. All programs offered by The Esthetic Institute follow similar procedures in that the same instructional methods apply and the same grading procedures are followed for each program. Those policies are stated in the school catalog and are considered to be an integral part of each of the program outlines contained in this site. All educational programs at the Esthetic Institute are taught in English.